An open letter to Ashland High School Coaches: Aidan Jones (JV Girls Soccer), Eric Wolff and Dana Yearsley (Varsity Girls Soccer), Steve Mitzel (Swim Team), Hans Voskes, Morgan Cottle & Molly Romero (Track Team), Mr. Karl Kemper (AHS Athletic Director). My companion this morning while I sipped a cup of coffee was one fondly known in our house as the “Big Red Jacket.” This particular B.R.J. probably won’t be worn too many more times, and yet – there I sat with a needle and thread trying to navigate the circumference of a little soccer ball with tiny stitches. It didn’t take me long to realize the symbolism of my choice in chores at this point in Sarah’s senior year: The B.R.J. isn’t a trophy case, it’s a memory box. According to her activities chart, Sarah spend over 3000 hours with all of you in one form or another – running around fields with a ball at her feet, swimming back and forth in the lanes of a swimming pool, and hurdling around a track. That’s 375 eight hour days – well over a full year of her life – that you have been in a unique position to guide, influence, mentor and coach my daughter. And guide her you have. 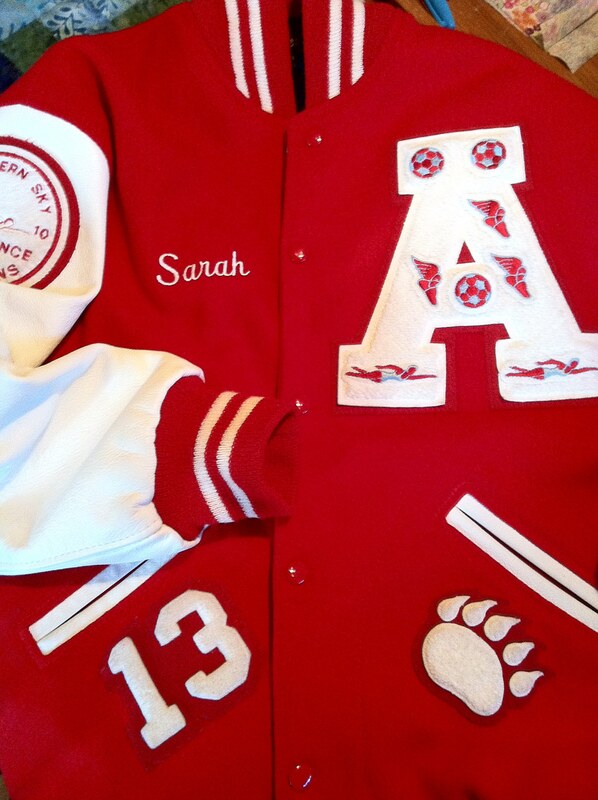 Four years, ten athletic seasons and nine Varsity letters later – I sit holding the B.R.J. in my hands and think about who she grew to be on the pitch, in the pool and on the track. I never saw Sarah argue with an official or treat an opponent with disrespect. She learned early in her high school career to get along with her teammates even when she didn’t necessarily agree with them, and her belief in “team” was always in evidence. She was never the highest scorer or held the fastest time, a natural or gifted athlete she is not. But she had tons of assists and would battle fiercely for the ball; she always picked herself up after falling down and finished her races – bruised knees and all, and she plowed through the water for two seasons even though it was something she never felt “good” at. She hasn’t been a whiner, her definition of a success has never been restricted to “win” or “loss” but whether an honest effort was made, and she has worked very very hard. You had much to do with these qualities of character. I admit it Coach, my kid hasn’t always agreed with you. She occasionally came home frustrated that your vision didn’t match hers, but she never let those moments turn into insurmountable problems. She might fuss for a day or two, but then she would do something unusual for the “typical” teen: she would let it go and move forward. Grudge free, she would come back to practice and give you her all – day after day after day. I often wondered at her motivation and commitment. It seemed uncommon at times. Why? Because she knew that you weren’t just her coach, you were also her friend. Mutual respect and trust go a long way, as does genuinely caring about one another. You created a very special relationship with Sarah based on these traits, and as a result – you truly got some of the best hours of her teenaged years. I’m going to miss watching her compete and that concentrated look she gets on her face when she has shut out the world and it’s just she and the ball, the dive, the hurdle – the moment. But here’s what I know: because of what you taught her and how you stood by her, she will transfer that remarkable passion to this next phase of her life. Teamwork will show up in discussions and class projects, focus will appear in writing and researching, her upbeat spirit will inspire new friendships, and that “coachable” kid you know so well will be present with every college professor who expects the very best from her – like you have for over 3000 hours. I hope I wasn’t too obnoxious with you about my kid these past four years (as parents tend to be), I tried to remember that playing time won’t determine my daughter’s fate – but the grace she learned along the way will. I hope that you know that I respect the huge commitment, energy, and love you have given not only to Sarah – but to all the kids you take the time to coach and care for. You are under acknowledged, barely compensated for extremely long hours often spent in lousy weather, and you have to wear lots of red clothing for many weeks of the year. Despite all that, you really made a difference in Sarah’s life and gave her some incredible skills for the future. I’ll have one more little winged foot to sew onto the B.R.J. in about three weeks, and then we’ll hang it up. It’s a little sad, but the memories are fantastic, and I thank you – from the bottom of my heart. This entry was posted in Siftings and Essays of the Heart, Through My Lens and tagged Ashland, Ashland High School, Coach, Soccer, Sports, Swimming, Thank You, Track. Bookmark the permalink.